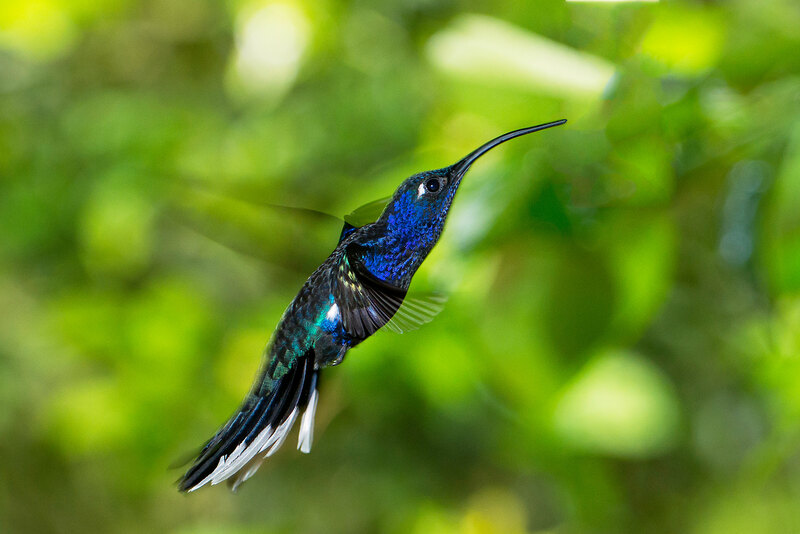 While in Honduras last February and staying at the Lodge at Pico Bonito, my guide for the day, German Martinez, who was assisting me locate wildlife in Pico Bonito National Park, told me about a “hummingbird sanctuary” about 30 minutes north of the lodge. 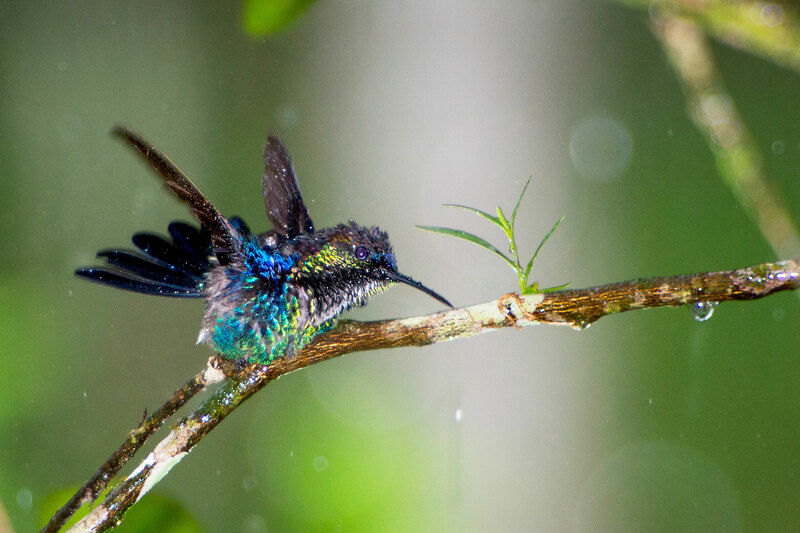 He said, the sanctuary was home to hundreds of hummingbirds and as many as 10 different species. It was known as Rio Santiago, probably because it was located near the Santiago River. German definitely had me very interested. 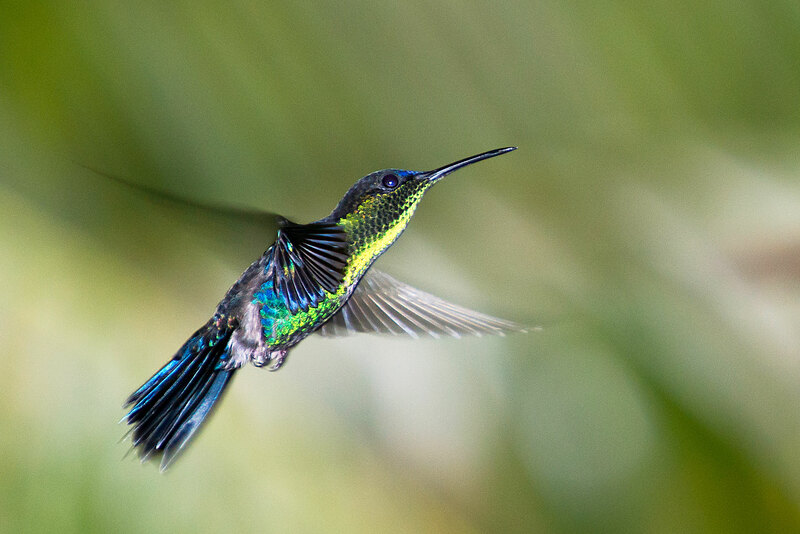 I had attempted to photograph the many hummingbirds that were around the lodge, but their fast and sporadic movement made them very difficult to photograph unless they perched on a nearby tree or bush, and I was not satisfied with what I had captured so far. Therefore, it was an easy decision to travel out of Pico Bonito, although I had no idea what to really expect based solely on German’s vague description. I wondered: would there really be many hummingbirds; at what distance would they be from me and my camera; what would the light be like to photograph them; would it be heavily wooded and shady or more open with harsh afternoon sunlight; and would I lose an afternoon of exploring and photography around Pico Bonito, if the hummingbird sanctuary did not work out. There was only one way to find out, we would go the next afternoon. The lodge furnished a vehicle and driver, and German and I left for Rio Santiago after lunch. We drove north from the lodge for about 30 minutes and turned west on a narrow, rugged dirt road. I asked German how far up the dirt road we were going, and he replied about 4 kilometers. It seemed more like 10 kms, because the road was winding and very rough, and it had very recently rained so it was also muddy. As we drove up the dirt road, we passed many small, ramshackle homes, typical of how many Hondurans live in the rural areas, and it was very rural. There were chickens crossing the road, loose dogs running about, and a few Hondurans walking with machetes. I asked about them. The mountain range, called Cordillera Nombre de Dios, which is encompassed by the Pico Bonito National Park, grew closer as we drove the dirt road. It was very overcast, but it was also very beautiful and green. It was a significant contrast to home in wintery Virginia. Where were they taking me, I wondered as the van slowly made it around and through large ruts and holes in the dirt road, and what was this place going to be like? 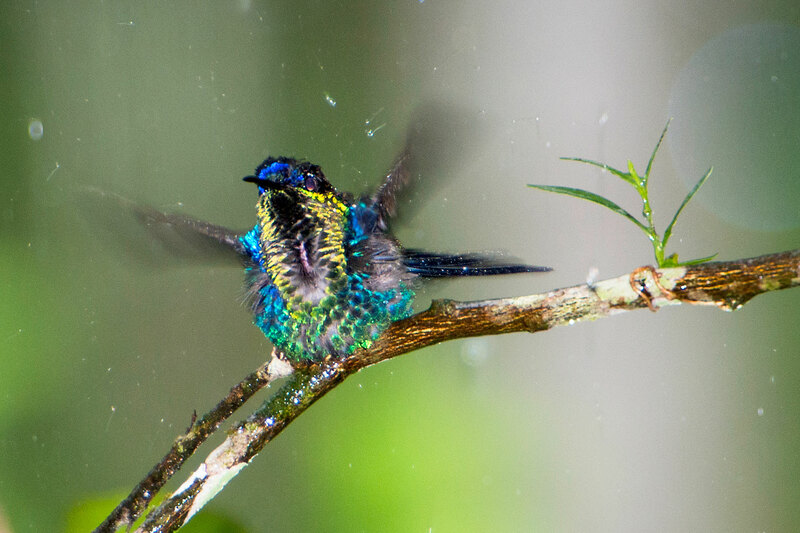 Eventually, we arrived at the Rio Santiago “hummingbird sanctuary,” which turned out to be the private property of Terry Habdas, who is a Canadian that lives on 80 acres that abut to Pico Bonito National Park. Terry had about fifty hummingbird feeders around a facility that catered to visitors that came to see the hummingbirds. 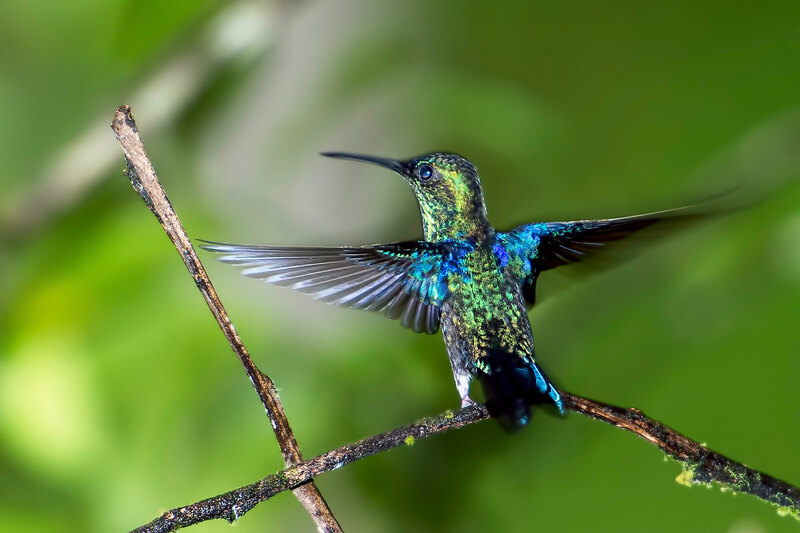 German had not exaggerated; there were easily a couple hundred hummingbirds buzzing around from feeder to feeder, bush to bush, and tree to tree. They were flying all around us and within what seemed like inches at times as they buzzed by. They were like little jet fighters often buzzing each other, because they are very territorial. After arriving, I couldn’t get my camera gear set up fast enough and start photographing. German told me that Terry goes through over 80 pounds of sugar a week feeding the hummingbirds. Terry also had staff that were refilling the feeders for the next morning. They start to feed early. Terry stayed with us most of the afternoon and watched as I photographed the hummingbirds, switching between two different camera bodies and different lenses. It was very overcast, which actually worked out well, minimizing what otherwise would have been harsh afternoon light. 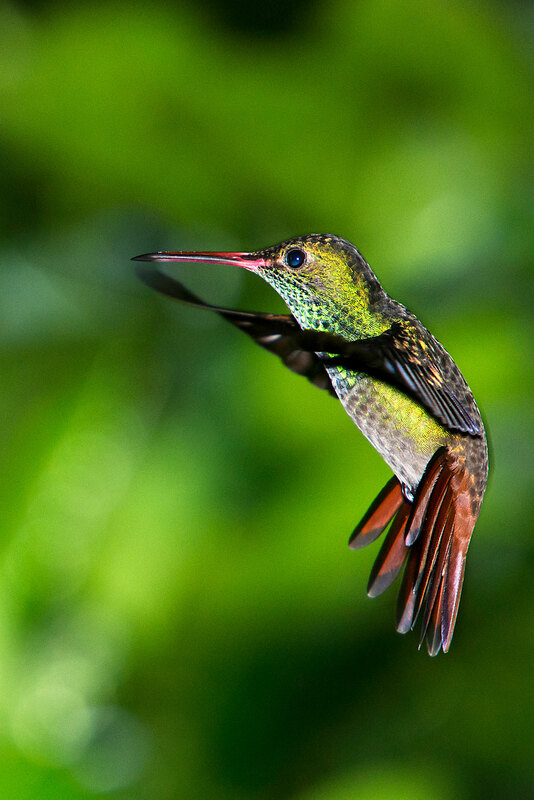 In order to photograph the extremely fast hummingbirds in the dim light, I used a Nikon SB900 speedlight (flash) and Better Beamer, a device that attaches to the speedlight and extends the reach of the light, as well as focusing the light on the subject. Then, the heavily clouded sky opened up, and it began to pour. It slowed the hummingbirds down a little, but they continued the fly about in the rain. 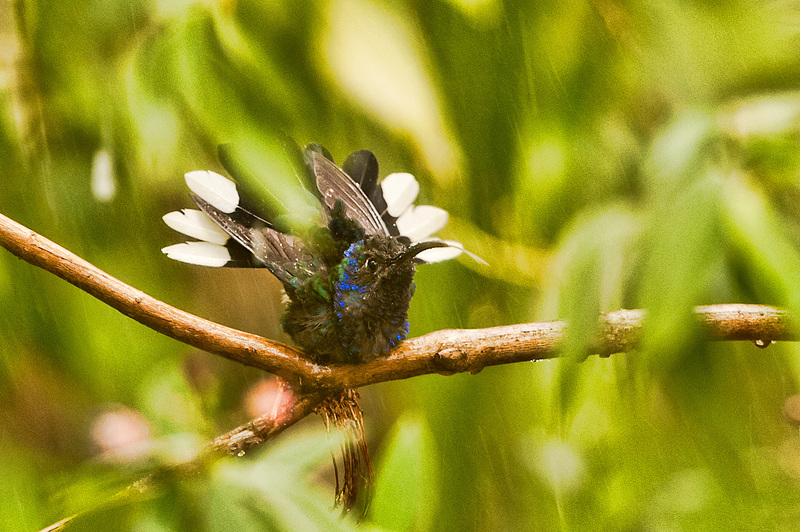 Several perched in a nearby tree and took advantage of the pouring rain to take a “shower,” flapping their wings vigorously and making very interesting images (below three images). We did not leave Rio Santiago until about 4:30. I thanked Terry for his warm hospitality and conversation. Terry told me never gets tired of watching the hummingbirds, and I agreed, they were fascinating to watch. It turned out to be an incredible afternoon. I probably will never see that many hummingbirds in one location again, unless I return there. 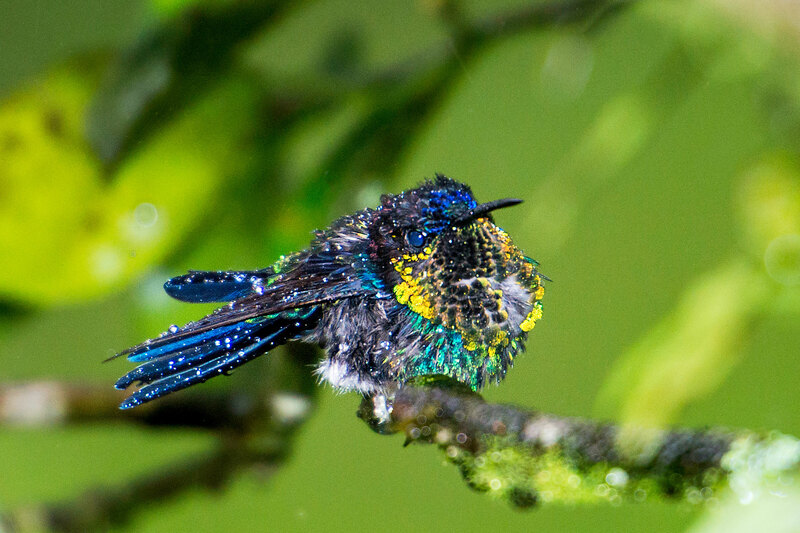 I was able to photograph six of the ten hummingbird species that inhabit Rio Santiago. You can see many more of my hummingbird images on my website at: http://stabone.com/p90686516 Each of them is identified for those that want to know the type of hummingbird. 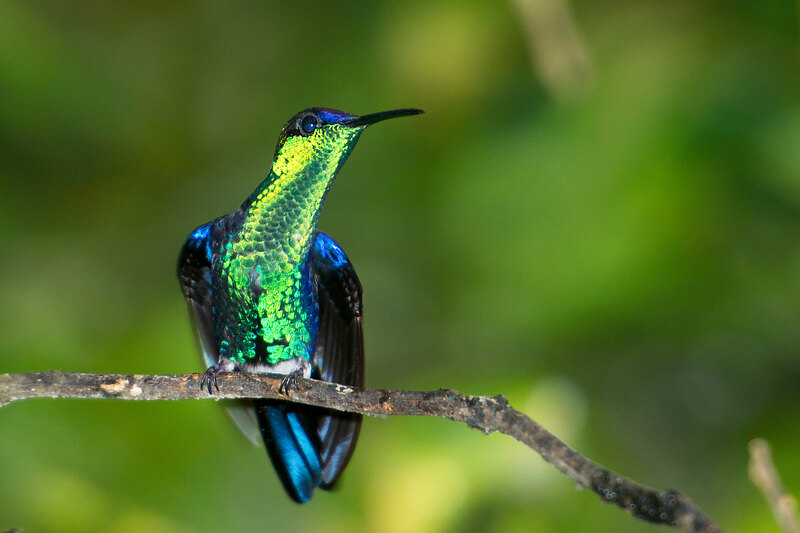 This entry was posted in Bird Photographs, Nature, Wildlife and tagged Honduras, Hummingbirds, lodge at pico bonito, nature, Pico Bonito. Bookmark the permalink. 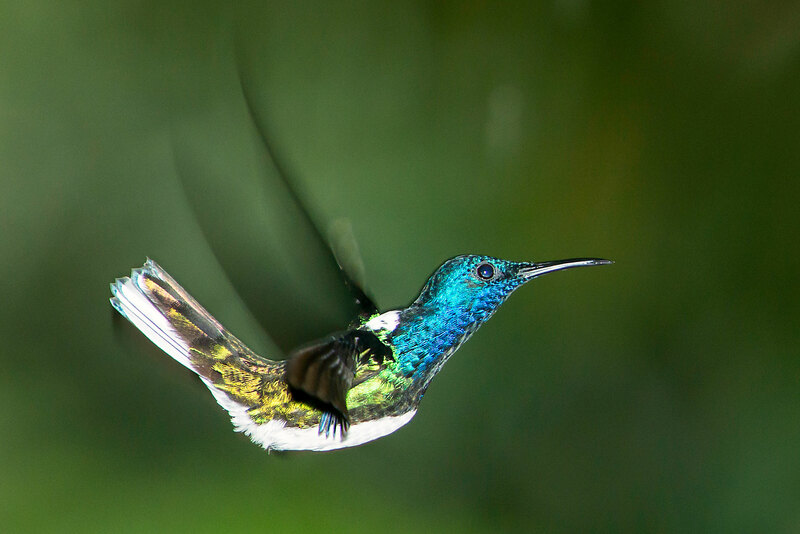 Beautiful hummers and excellent photography. Reminds me of our trip to Psgah View Ranch where we have stayed for several seasons; we had a bird feeder right outside of our cottage and hummers used to come to feed just outside of our door. Nice reminder of better times. La vita bella. Beautiful images of amazingly beautiful birds! You had an amazing adventure! Awesome Steve! I’d love to see Honduras and even more Costa Rica! Looks like very fun trip! You are a magician with your Cam….Congratulations!!!! Another great story and set of images. Excellent combination of flash and shutter speed to keep the body and head in sharp focus yet allow the blur of the wings to show the motion and speed of the wings in flight. And the bokeh is like butter! A whole lot of “5’s”. Steve good evening these are so pretty. They are really nice close ups! 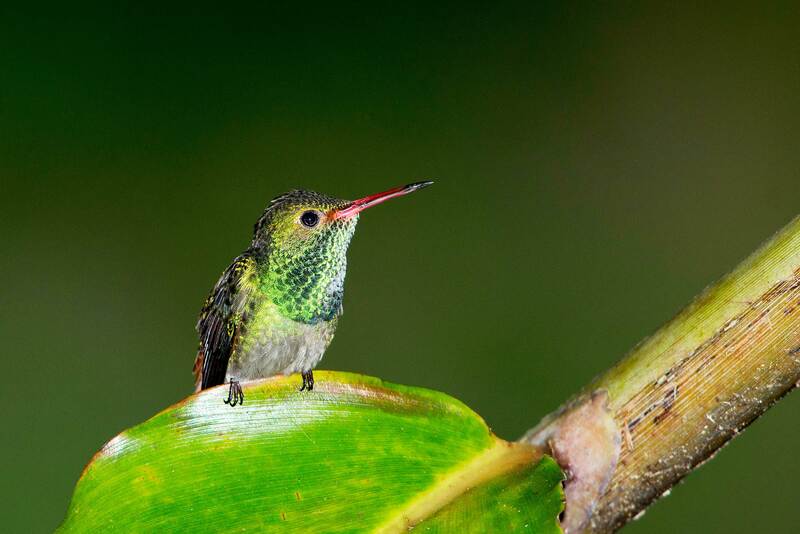 Pingback: 20 Vivid Hummingbird Close-ups Reveal Their Incredible Beauty - Whats the Buzz ? Pingback: Chaque matin, ce retraité appelle son nouvel ami par la fenêtre... Une amitié inattendue ! May I purchase on of the photos or onto files in high resolution? 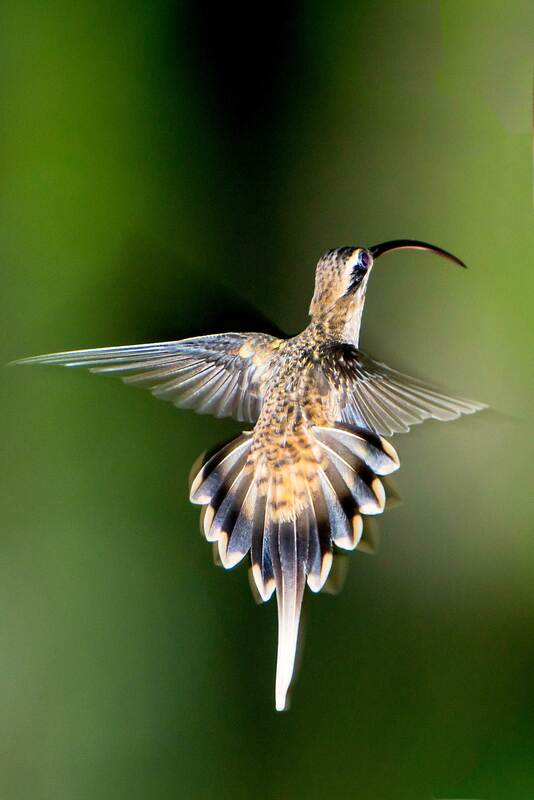 Pingback: Pictures of humming bird | Welcome to Look-is-Learn!